Recently Nick Clegg and Nigel Farage were debating about the UK staying in the EU on live TV. Do you watch televised debates by politicians? Only political debates when there is a big decision to be made politically as debates can be a good source of information not otherwise found. When it was the last elections, and them three main parties were debating live for the first time several years, I watched that. I think part of the reason was because it was the first time that I was allowed to vote. 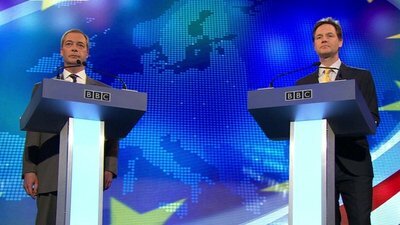 Nick Clegg and Nigel Farage have been giving televised debates about the EU, and I had intended to watch them, but got the time wrong and missed them. I also occasionally watch Question Time and Newsnight. Absolutely not. I will read the results of a debate, but I can't stand watching people argue, it just grates on my nerves. The arguing annoys me too, but I find it helps me understand the situation better than just reading. public can see ...........''question time'' in Parliament. A real look how Our Government works. It has been likened to a ''kindergarten for Adults''. Where tempers are high and questions are many. Very interesting, to really see how our Politicians behave. Or should I say don't.!! Who is your favourite TV puppet?